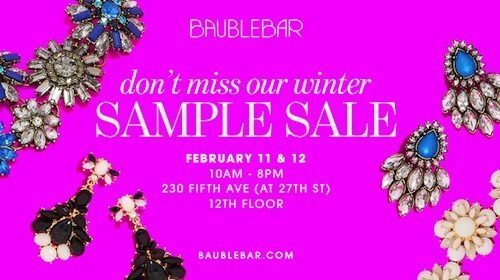 Hopefully, after trudging thru the snow, these sample sales will make it all worth it! Deal: Up to 85% off retail prices on the current collection. Samples are $25 and other styles are $49 or $99. When/Where: Monday, February 3 through Wednesday, February 5. Daily 11am—5pm. 270 W 38th St between Seventh & Eighth Aves, Ste 1202 (212-398-2980). Deal: Up to 80% off women’s ready-to-wear and accessories. The sale will also include a limited selection of men’s clothing and children’s. When/Where: Tuesday, February 4 through Thursday, February 6. Daily 11am—7pm. 261 W 36th St between Seventh and Eighth Aves, 2nd Fl (no phone). Deal: 40% to 70% off women’s merchandise at the store’s end-of-season sale. Follow their Instagram account for a look at the merchandise. Deal: Deep discounts on women’s merchandise, with everything priced at $75 or less. Prices start at $10. While the rest of the public can shop on February 11 and 12, they’re offering a special treat early access! RSVP here to get access to all their shiny jewels on Monday, February 10 between 10am and 8pm.